This is a book that probably isn’t read very much any more, and if it’s remembered, it’s for the title, which has a common usage that is entirely at odds with what the authors intended. But it is still somehow in print – one would expect more for historical interest than anything else, though the Amazon reviews suggest otherwise. I had seen the not particularly good film version with Marlon Brando, which features the Thai novelist and politician Kukrit Pramoj as a southeast Asian prime minister before he actually became the prime minister of Thailand; but despite now being an American who’s lived in southeast Asia for coming up on five years, I’d never actually looked at the book until I finally got around to reading Graham Greene’s The Quiet American and started wondering about American responses to that book. Read sixty years later, The Ugly American is more than a little astonishing. The Wikipedia page gives a reasonable background on the book some sense of its effects on the world: it’s credited there with being the impetus for the creation of the Peace Corps. It might also bear some responsibility for American actions in southeast Asia in the 1960s and 1970s. While it is hard to make an argument for this being particularly good fiction (it is not a “novel,” as Wikipedia confidently declares), it is clearly successful fiction, shaping American perceptions of what southeast Asia was like. (In this, it’s not dissimilar to Anna Leonowen’s The King and I, a deeply fictionalized memoir of her service to Rama IV of Siam; in several further incarnations, must notably the Yul Brynner-starring musical, it continues to shape American perceptions of Thailand. Peal Buck’s The Good Earth, now mostly forgotten, also falls into this category.) And for this reason, it might be worth reading now: not necessarily to inquire whether the book is an accurate depiction or not, but to think about how this book has been read, and what a book can do. Read historically, this is a somewhat flummoxing book. Most of it takes place in an imaginary country, Sarkhan; geographically, this appears to roughly be a stand-in for Vietnam, though Vietnam also appears in the book. Confusingly there is no mention of colonialism until halfway through the book, when the ambassador to Sarkhan goes to Vietnam to aid the French forces there fighting the Communists. What the French are doing in Vietnam, or why they should be fighting the Communists, is not explained. Nor is Sarkhan’s colonial status explained. One might assume that since Sarkhan has seemingly not been colonized (and is led by an all-powerful king) that it’s modeled on Thailand, the only state in southeast Asia that was not colonized. These distinctions matter a great deal: Communism’s success in southeast Asia was as a direct response to the predations of colonialism. In The Ugly American, Communism is an evil virus, kind of like hoof and mouth disease, that just tends to spring up among backwards people. It should be surprising to absolutely no one, after this loving description, that Donald and Roger turn out to know English and to be Communist spies; Donald is tortured into confessing by another “good Asian,” an Episcopal representative of Chiang Kai-shek, over to have martinis with the ambassador. Ambassador MacWhite, whose perspective this is from, is meant to be the keyed-in ambassador, replacing the know-nothing ambassador; he’s the one who goes to Vietnam to help to French fight the Communists. His idea that the “decent Asian” should be a servant educated just to the point of usefulness isn’t examined any further. (There are echoes here, as well, of more domestic American attitudes towards race. Later, a black American turns up, having joined the French Foreign Legion, presumably to distance himself from 1950s America; for his trouble, the authors have one of his eyes torn out by the Communists.) Donald and Roger are symptomatic of the portrayal of Asians in this book: except for one at the end, they all manage to betray their American friends. Structurally, the book is a collection of 17 vignettes, mostly drawn around one character. Some of these are clearly fictionalized versions of real people; some might be recognizable to a reader with more historical knowledge than I have. Those who work for the State Department are almost uniformly buffoonish. I can’t tell how accurate a depiction of the State Department in southeast Asia in the 1950s this is: maybe everyone was getting drunk all the time, not bothering to learn languages, and glorying in having servants. The solutions proposed (not being drunk all the times, learning languages, talking with locals) do seem reasonable, if perhaps obvious. But the cartoonish view of the locals throws the book off wildly: if only, it suggests, someone smarter explained to them that Communism was evil, they would be on our side. This obviously worked out well. Two more things worth noting about this book. Someone must have noticed that this seems to be the urtext of Thomas Friedman’s style of column-writing, especially the characters who are lauded, caricatures of hard-working Americans trying to press their commonsense ideas on the less fortunate of the world who haven’t been lucky enough to hear their homespun wisdom. 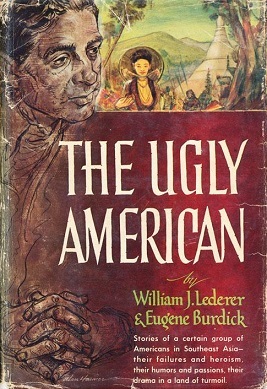 Homer Atkins, one of these characters, is a level-headed engineer, the Ugly American of the book’s title. He knows by looking at his hands that he is ugly, but that somehow reminds him of his superior inner qualities. This hamfisted metaphor managed to enshrine the “ugly American” in the English language, but the book’s complete lack of control over its reception is impressive. The ugly American as now understood has nothing at all to do with what the book is meant to convey. It has a lot to do with what the book didn’t intend to convey. The authors made him ugly, but gave him what they thought were good intentions. In the popular appropriation of the title, his ugliness became what seemed an all too apt metaphor for his attitudes and goals, and their consequences. The authors failed to understand their own accomplishment. They fostered a popular, communal re-writing of “Dorian Gray,” demonstrating the validity of Lord Henry’s proposition – “It is only shallow people who do not judge by appearances. The true mystery of the world is the visible, not the invisible.” In this version (as in Wilde’s), the portrait in the attic (in this case, “The Man of Good Intentions”) is ultimately of no avail. What you see is what you get.